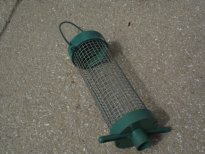 There are many different styles of feeders for nuts and seed. Generally, you choose whatever you like the best! There are, however, a few points that are worth considering. The materials used in the construction of a typical feeder could have a significant impact on how easy it is to keep it clean and how long it lasts. Some are made entirely of metal and can withstand vigorous cleaning methods so are easy to maintain. The 'cage' types come in a variety of shapes - cones, balls and more elaborate designs - that cannot be disassembled but a good going over with boiling water and a brush followed by a disinfectant rinse does the job nicely. The 'traditional' style can normally be taken apart for cleaning in the same way as the plastic ones and should be treated accordingly. Be well warned that some traditional styles may look like metal may but are actually made of 'chromed' plastic! Be sure that is metal before using the boiling water. More common, and cheaper, are all-plastic seed feeders. These do not last as long as the metal types as the plastics use do deteriorate with age. They also need more care when cleaning as they really must be taken apart to do the job properly. There are good designs and poor designs. I don't wish to upset manufacturers but some of their products are definitely not well thought out. The following images are of the latter variety - one of the commonest designs available. The first image shows the feeder as it comes. The mesh fits inside the base, usually clipped in four places. The base, however, is a cup as seen in the second image. Peanuts lying in the base can not be reached by feeding birds so, if left, will soon form a solid mass that will harbour fungus, mould or parasites. These feeders are very difficult to disassemble for cleaning but they do have to be taken apart for them to be cleaned properly. A small screwdriver can be inserted through the holes in the base to catch the edge of the mesh and prise it off the clips. This will probably distort the mesh so care must be taken when reassembling to ensure that a good section of the mesh engages with the clips. A feeder of this type is not one that can be recommended. However, there is one trick that can be used. 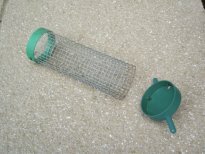 The third image shows a portion of a plastic bottle top that has been cut to give a tight fit inside the feeder mesh. Note that the bottle cap has been retained! 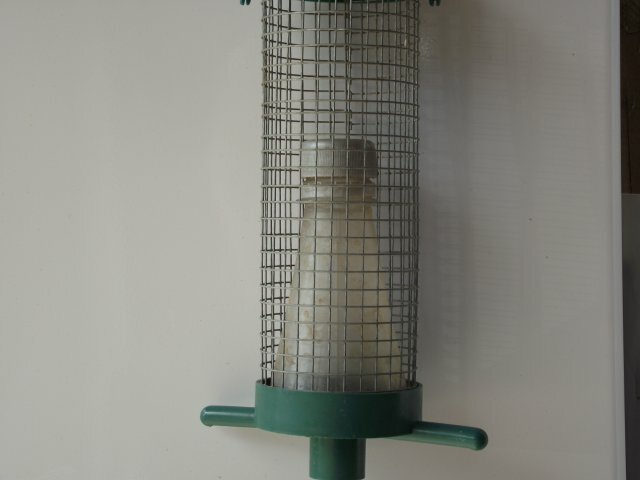 The final image shows the feeder with the bottle top fitted in place. 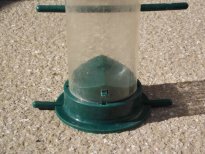 This ensures that peanuts are forced to the outside of the feeder, where the birds can easily reach them, and do not go in to the cupped base of the feeder. It isn't a foolproof solution but it certainly helps! A better design has a wedge shaped base to divert the peanuts to the outside.Although this image shows a seed feeder there are peanut feeders using the same style. The wedge is seldom peaked enough to do the job properly but it is still a big improvement over the previous design. Again, the mesh may be attached to the base by clips - but they are on the outside so easily reached - or they may be joined by a simple 'push-through' rod that also serves as a perch. This is, by far, the easiest type to disassemble for cleaning. The plastic rod will inevitable break eventually - but a four-inch nail makes a good substitute! 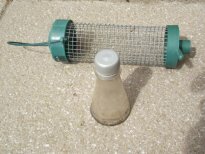 Basically there are two types - one for nyjer (or niger) seed and one for mixed seed.The nyjer seed feeder is simply a plastic tube with small slots for the birds to extract the seed. Generally, the tube is simply clipped to the base in two to four places although the clips may be inside or outside the base. A small, thin screwdriver will suffice to lift the plastic tube gently off the clips - the tube plastic is usually flexible enough to clear the clips without splitting. Disassembly is thus normally a simple task. The mixed seed feeders are less easy. They have two or more pairs of apertures for the birds to get at the seed. To clean them properly almost always involves disassembly - and therein lies the problem. In a 'good' design the two opposing apertures are joined by a very small screw (usually a cross-point). Once the screw is removed the two apertures can also be detached from the tube. Like the nyjer type, the tube may be attached to the base by clips although occasionally the rod method can be found. The real fiddly part, though, is getting the screw back in! Alas, many do not have the opposing apertures joined by a screw and are simply welded together. It is all but impossible to disassemble this type and, should you succeed, you may find you cannot put it back together again! For this type, removing the top and base for access and then scrubbing with a long reach bottle-brush is really the only answer. The commonest type is a simple 'cage', available in two sizes, to suit either the standard 'small' fat balls or the large ones. These are really suited ONLY for fat balls that are enclosed in netting. It can be useful to install a wire inside the cage and thread the netting on to this wire - it makes it easier to remove the netting once the ball has been consumed. Many of us buy a tub of 50 fat balls. It is generally cheaper and you get a useful bucket with them. However, the most common tubs have fat balls that are NOT netted. 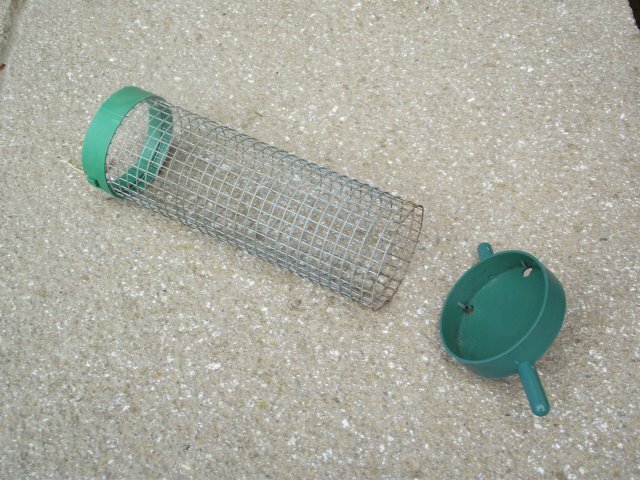 If you use these in a 'cage' feeder then they will fall through long before the ball is consumed. These tubs normally are of the smaller type balls so you can actually place them inside a peanut feeder - they won't fall through but you may have problems in cleaning the feeder. There is some controversy over the netting on fat balls. One school of thought is that there is a high risk of birds getting claws caught in the netting and most organisations recommend against their use. However, despite some research, I have never encountered such an incident and have yet to find a fully documented case of that actually happening! The case is out - but the risk must be exceedingly small. No matter the type, a feeder should be disassembled as far as possible (and preferably completely disassembled) before cleaning. Cleaning usually involves a stiff brush and plenty of water, adding detergent where necessary. You should scrub thoroughly until no trace of any debris remains. Rinse all parts thoroughly with clean fresh water and then rinse again using a disinfectant mix. You can buy dedicated disinfectant but a simple mix of one part of household bleach to 20 parts of water will do the same job at a fraction of the price! Allow all parts to dry thoroughly and then reassemble the feeder. Rather than pouring your leftover disinfectant down the drain, why not dispose of it underneath where your feeder was hanging to disinfect the ground too? Always check your feeders frequently to ensure the contents are in good condition. Particularly in wet weather, damp nuts or seeds can quickly become a solid mass and can become mouldy. If weather is warm as well as wet, germination of seeds can also occur. If your nuts or seed go into a solid mass, become mouldy or start to germinate then you should discard them immediately and do a thorough clean of the feeder before putting it back out and, when you do so, only put out a small quantity of food. If clean food isn't being eaten then your birds may have opted for some other type of food. 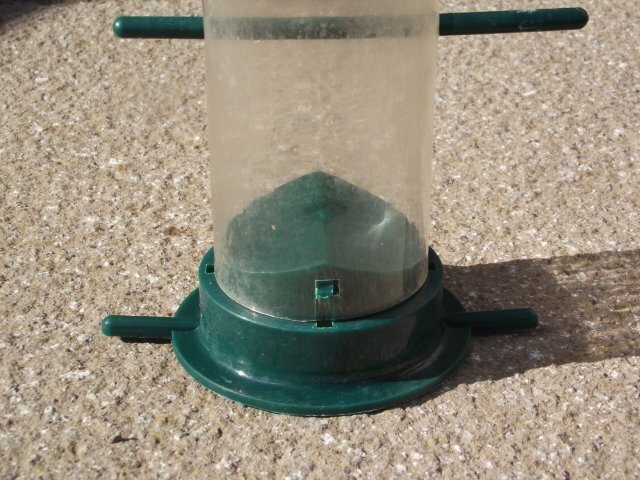 Don't leave your feeder out in hope, take the feeder down and try something else instead, again only a small quantity. To reduce the possible spread of disease, you should move the feeders to different locations (ideally more than 6ft apart) periodically. If your hanging points are limited and you have a few feeders, try leaving one point vacant at a time and rotate at intervals. There is ongoing debate as to whether or not to feed birds during the breeding season. The argument against is the fear that a bird may try feeding something like a peanut to its young, causing it to choke. There seems to be no actual record of this having ever happened. On the other hand, there is plenty of evidence that birds continue to feed their young with exactly the food they should but the adults will do a brief stop at feeders for a quick, much needed 'refuel' for themselves. The advice from ALL the bird organisations is to continue to feed all year round but perhaps reducing the quantity until the young birds have left the nests. - do not put out more food than is being eaten within a few days. It will go 'off', possibly with seed germinating but certainly with moulds forming, so little & often is the way to go. - choose your site with care. The two main predators that know only too well that feeders make for easy pickings are cats and sparrowhawks. To avoid cats, place your feeders where there is plenty of open ground around them so that the birds can see approaching cats. But also place them where there is as clear a view of the sky as possible and some nearby cover (trees or shrubs) so the birds can see sparrowhawks coming and have somewhere to dive into for safety. In late autumn, you should attend to cleaning out your nestboxes to ensure they do not harbour parasites and fleas. This entails opening up each box and removing all traces of old nesting materials together with any other debris that may be there - spiders webs and remnants of wasp nests are quite common - and check that the box is in good enough condition to do another season. Go over the interior with a stiff brush. An application of disinfectant (1 part household bleach to 20 parts water) does no harm. Allow them to dry thoroughly before closing them up again. Bear in mind that the boxes may be used as shelter by some birds during the winter so you may wish to put a small amount of dry material, but not material taken from an old nest, in the bottom to make it cosier. Dry grass or leaves will do fine. If you are putting up a new box or relocating an existing one, ensure it is located where it is safe from cats and hawks (like your feeders), and it is not located close to any bird feeding station. Most of our garden birds are not too fussy about the height above ground but 6 to 10 feet up is a good safety measure. Having it where there is a perch nearby is a good thing as many birds like to stop for a good look around before they enter a nest. According to many bird organisations having the box facing roughly eastwards is best and open to the morning sun. This allows the early sun to warm the box after the chill of the night and may also place it in shade from the hot afternoon and evening sun. A box facing anywhere between south and west is regarded as a bad choice, slow to warm up in the morning and may get unbearably hot later in the day.However, these recommendations seem to overlook the fact that boxes have THREE exposed sides, not just the one where the hole is! In real life, birds will make their own choice on this!